Remakes of classic films are often shunned before the celluloid film reel is placed in the projector (or, more likely these days, before the digital on-switch is pressed). When it was announced that a reboot of the Evil Dead franchise was in the works, fans of the scintillating original were probably more unappreciative than they were excited — although Sam Raimi’s involvement most likely eased the pain for many. Ensuring their favourite film’s legacy is not put at risk is at the forefront of a lot of cinema lovers minds, and so it should be. In return, this amps up the pressure placed upon the shoulders of directors who are at the helm of remakes, particularly in the eyes of the fans. When May of 2014 comes along and Gareth Edwards’ recreation of Godzilla hits cinema screens across the globe, he will need not worry too much about living up to the expectations set by his predecessor. 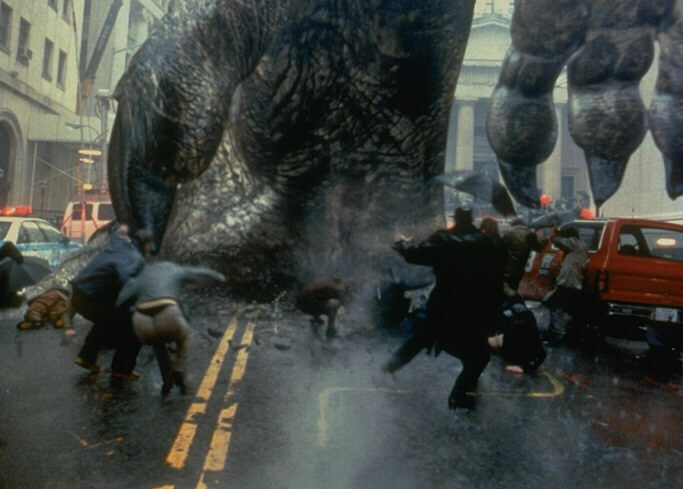 Unfortunately, Roland Emmerich’s 1998 version of Godzilla misses the mark on just about every level. Godzilla follows Niko Tatopoulos, a scientist whose work in Russia is interrupted when he is recruited by the American government to analyse the origins of a giant mutated lizard, and help find a way to stop it from wreaking havoc in New York. That is it — the whole film is essentially Godzilla clumsily stomping its way through the streets of Manhattan. There is absolutely no time at all set aside for any dramatic tension to build (the monster appears on land not long after the film begins) and this means the majority of the film is very anticlimactic. For example, when historic buildings are being decimated later on in proceedings, there is no element of shock or outrage because dozens of such buildings have already been left lying in ruin over an hour beforehand. This is an enormous problem that the film never manages to overcome, and as a result Godzilla is ultimately a tedious, repetitive watch throughout. Of course, Godzilla‘s desperate need for a slither of drama is not the only nuance missing and in dire demand — there is also the need for a semblance of plot (that is, other than a giant monster swinging its tail into bricks and metal for almost two and a half hours). The audience is told early on that the origins of the monster Godzilla is connected with radioactive, nuclear testing in French Polynesia, where an iguana nest is exposed. This opens up a multitude of opportunities for the filmmakers to install social or political issues into the film, and use the abnormal, human creation of Godzilla as a metaphor for humanity’s (and, in particular, the western world’s) disregard for the consequences of their power struggles. Adding elements such as this to the film would invigorate it, generating greater depth and giving the audience something to think about during the events. 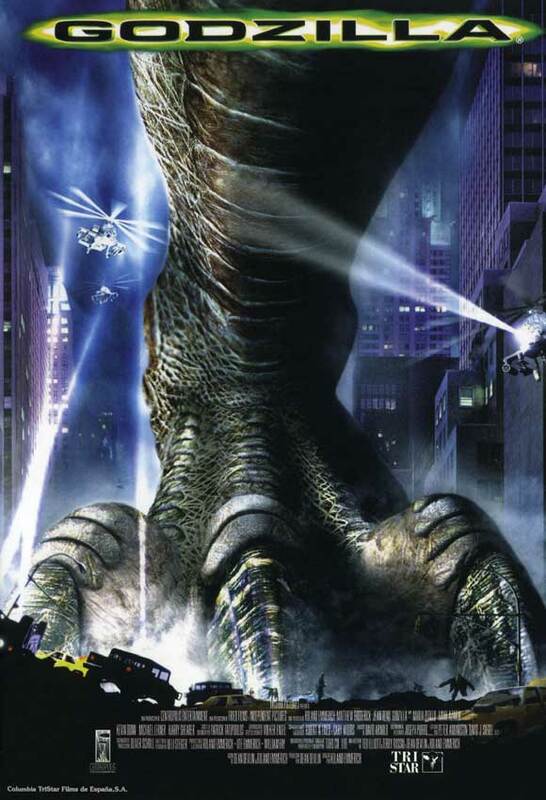 Instead, the viewer is subject to a messy, uncoordinated plot, where the ‘bad guy’ (Godzilla) does not really evoke that sense of fear or tyranny that a monster should, and the ‘good guy’ (Matthew Broderick) spends the entire time running aimlessly around New York not doing anything in particular. The lack of continuity throughout the film is a cause for concern as characters end up being perceived in ways they are not meant to be. There is a scene where reporter and former love interest of Tatopoulos, Audrey Timmonds (played by Maria Pitillo), meets Tatopoulos for the first time since they split up many years before. After holding Tatopoulos in a bad light for him still feeling angry towards her after she walked out on him all those years prior, Timmonds decides to steal Tatopoulos’ secret tapes and (lo-and-behold) they somehow end up on the national news. This not only makes Timmonds, a character who the audience are supposed to be rooting for, look dastardly, but it also shows the main protagonist and ‘hero’, Tatopoulos, as nothing more than a gullible fool. In terms of the acting in the film, it relents from being satisfactory and therefore is in keeping with the rest of the offering. Matthew Broderick is a shell of the charismatic, funny and reliable lead he was in Ferris Bueller’s Day Off. The humour is also off-key and bland, so much so that the normally on-point comedic timing of Hank Azaria cannot aid goings-on. Harking back to the lack of sense or continuity involved in Godzilla, at one point during the outing the giant lizard sinks a navy submarine before the screen cuts back to a navy general who is informed by one of his subordinates that the submarine has been destroyed. This particular scene is placed in the film in order to encourage the audience to feel great sympathy towards the now deceased officers who were on board the ship. However, rather than successfully creating a sombre atmosphere, it only highlights that the monster Godzilla has already spent an hour rampaging through streets filled with people, yet there has been no mention of the obvious and unfortunate consequences of this. Perhaps the seemingly customary deaths of average civilians does not need addressing, and this would almost certainly be the case in any other disaster film. Unfortunately, Godzilla is lacking so much in any form of substance that when conventional features such as civilian deaths occur and are not highlighted, it is at least something for the — probably now bored — viewer to focus on. Also, apparently this gigantic, bellowing monster can successfully sneak underground and even hide in buildings. Who knew? James Bond could learn a thing or two about stealth from Godzilla. A big-budget re-imagining of the classic 1954 Japanese monster film, Roland Emmerich’s take on Godzilla is one which fails to deliver in almost every department. From a non-existent story to nonsensical plot points to unconvincing acting, the film is ultimately devoid of that sense of dread and imminent danger which every successful, encapsulating monster film should boast. Next time, can we keep Madison Square Garden and just take our chances?